Green fire is one of the most vibrant forms of colored flames. It’s also one of the easiest to produce with common materials! Borax and boric acid are two boron salts. Borax is sold as a laundry detergent booster or household cleaner. Boric acid is sold as a roach killer or as a disinfectant. Adding either chemical to a fire yields a vivid green flame. For best results, mix borax or boric acid with methanol, a type of alcohol, and ignite the solution. The alcohol will burn off, leaving behind a white residue from the boron compound. You can add more alcohol to produce more colored fire. The boron compound is not consumed, so it can be re-used. Copper sulfate is used as an algicide and root killing agent. You can sprinkle copper sulfate on a fire to impart a green flame. It mixes well with rubbing alcohol to produce pure green fire. The copper compound won’t be consumed by the fire, so simply add more fuel to maintain the color. This compound also works on a wood or charcoal fire, although you can expect a rainbow of colors from the interaction with other chemicals in the fuel. What does boric acid have that makes the fire green? The green is an indicator for the boron ion. 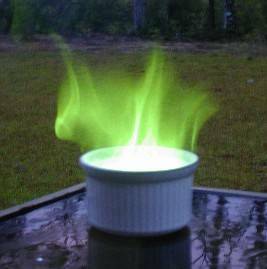 Borax also produces a green flame. igniting iron(11)chloride colorize the burner flame with a green color . I don’t remember subscribing to this website but I’m glad past me did. I learn sooooooo much from what you share with us. Definitely going to try it. Thank you so much for your wisdom!